Some of the more assiduous readers of my blog may remember when I was fat-shamed over freak shakes at a restaurant in New York. 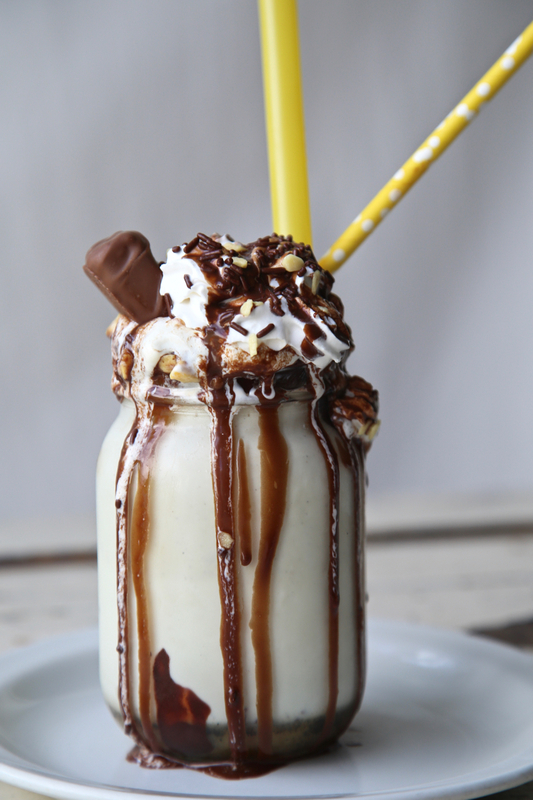 What is a freak shake? It’s a milkshake but not as you know it. This is not clean eating, in fact it’s the very opposite, the messier the better. Drips, sprinkles, a sticky rim, sweets protruding from every direction, cakes and biscuits propped on top, it’s a visual feast of outrageous proportions, but rather difficult to handle with refinement. Try to grip the glass and you are likely to end up with hands smeared with chocolate and caramel. 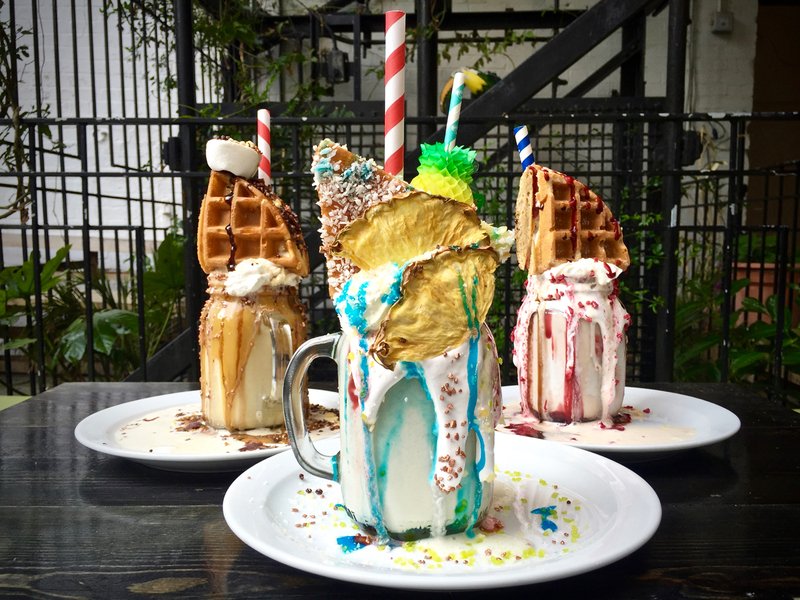 To drink a freakshake requires tactical elegance, to build one demands architectural ability. Use a tall jam jar such as a Mason, Ball or Kilner drinking jar, the rim helps to stop the overflow. Buy retro paper straws or thick straws. The thinking here is more is more. Yes I agree, this is silly internet meme food. Millennials, who drive this kind of thing on Instagram, seem to suffer from disordered eating: either demonising carbs, drinking kale smoothies or gorging themselves on Willy Wonka food. All kinds of fucked up really. This recipe first appeared in my weekly recipe column in Metro newspaper. Optional: to make it even naughtier, add alcohol. You can buy outrageous ‘hard shakes’, at Pond in Dalston, London. Break a few squares of white chocolate into a saucer and melt for 30 seconds in the microwave. Have another saucer with your chosen sprinkles, this time I used freeze dried strawberry and candied rose petals but you could also use any pink or red sprinkles. Dip your jam jar into the saucer with white chocolate, turning the jar around to make sure the rim is completely coated. Then lightly dip the rim in the other saucer full of sprinkles. Leave to set in the fridge for a minute or two. 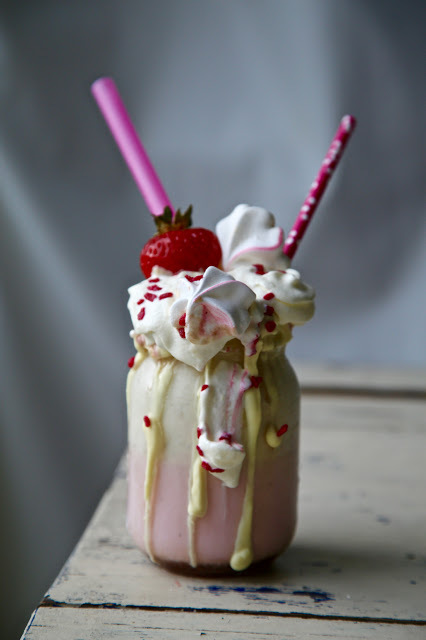 Add three or four scoops of vanilla icecream to the glass/jar, interspersing with slices of fresh strawberry. Top up with strawberry milk. Squirt whipped canned cream on top. Add a whole strawberry or two to the top. Break a few squares of the chocolate into a saucer and melt for 30 seconds in the microwave. Dip your jam jar into the saucer with the chocolate, turning the jar around to make sure the rim is completely coated. Then lightly dip the rim in another saucer of sprinkles. Press in some mini honeycomb pieces to the chocolate rim. Add three or four scoops of vanilla icecream to the glass/jar, interspersing with squirts of salted caramel sauce if not using salted caramel icecream. They are just yummy! I want to try this. Thanks for your recipe! The best I read so far! Amazing! It looks so fresh and cool. I particularly like the amazing photos. They make me want to try it immediately. Amazing. These picture make me hungry.I love cooking and I love this recipe. I will try this recipe tonight. 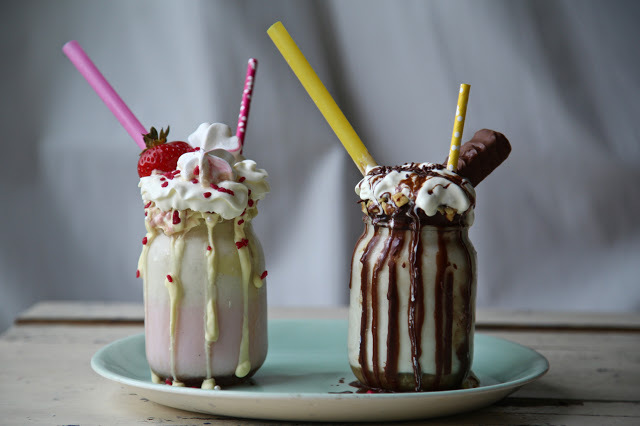 Freakshake look delicious. Freaky but delicious! Best choice for party and summer. Thanks for sharing! OMG! Awesome choice for this summer! I will make this for my party next Sunday.